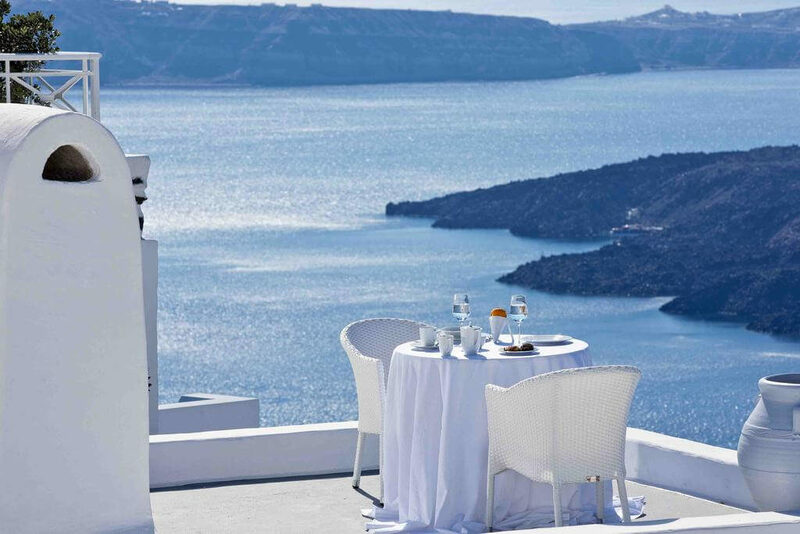 Overlooking the Grand Caldera, with deep blue seas and the bright white buildings lies Santorini in Greece. 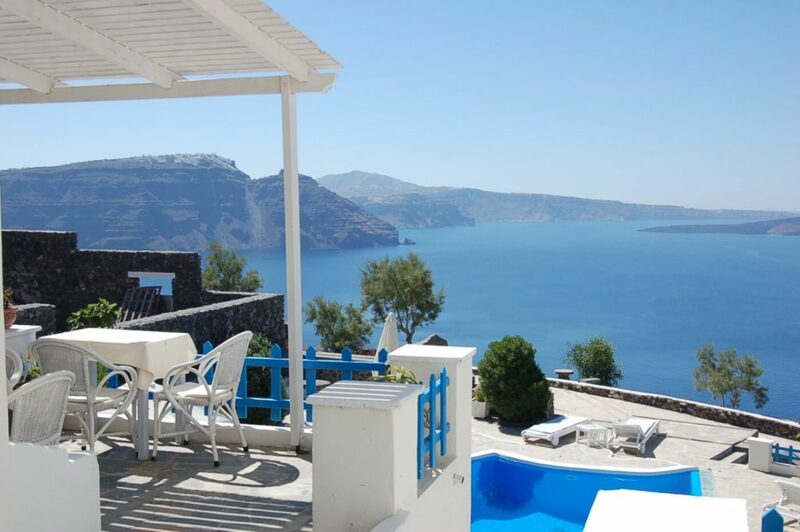 The place is flooded with people and especially new age and young couples’ who want to spend their honeymoon period amidst the beauty of Santorini. Along with the abundance of natural beauty this place also offers luxurious hotels with great views and out of the world hospitality that will leave you love-struck and amazed. 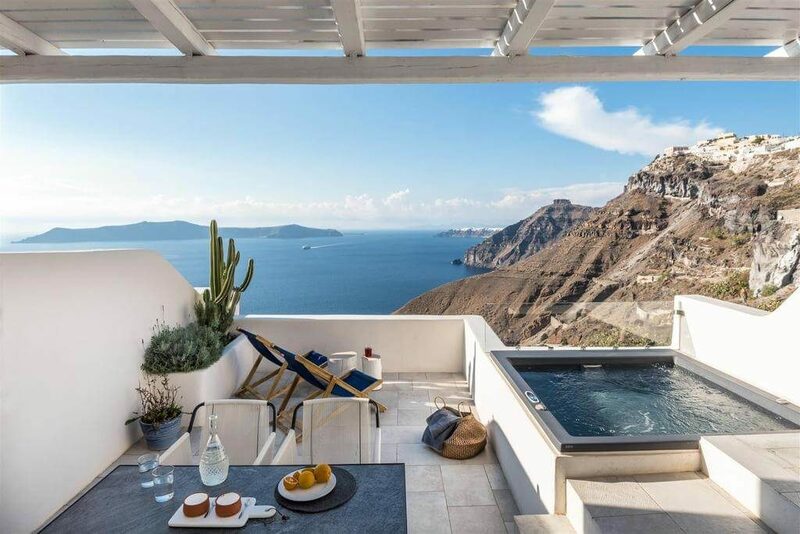 Located in the middle of Fira and overlooking the azure Aegean Sea, Dana Villas Hotel and Suites is the perfect combination of class and hospitality. The hotel’s specialties include the infinity pool, bar by the pool, outdoor heated jacuzzi and spa which is why this is one of the most preferred hotels by couples who want to get married. 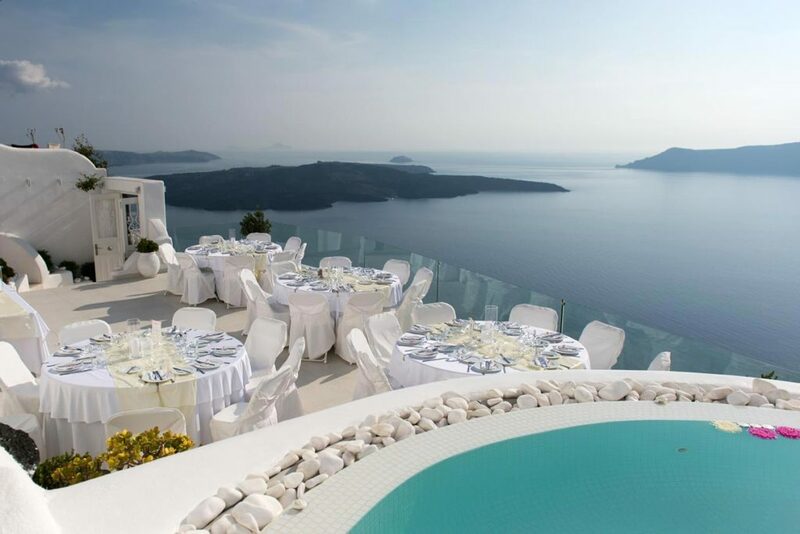 The Alexander’s Boutique Hotel is one of the most affluent hotels in Santorini. To top it all you also get a complimentary bottle of wine upon your arrival! The cave villas and rooms will surely make you feel like the royalty that you are while providing utmost warmth and kindness. 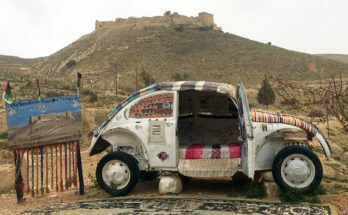 The unique part about this hotel is that every room is decorated differently with antique showpieces and handmade artifacts that depends upon the character and persona of the traveler. 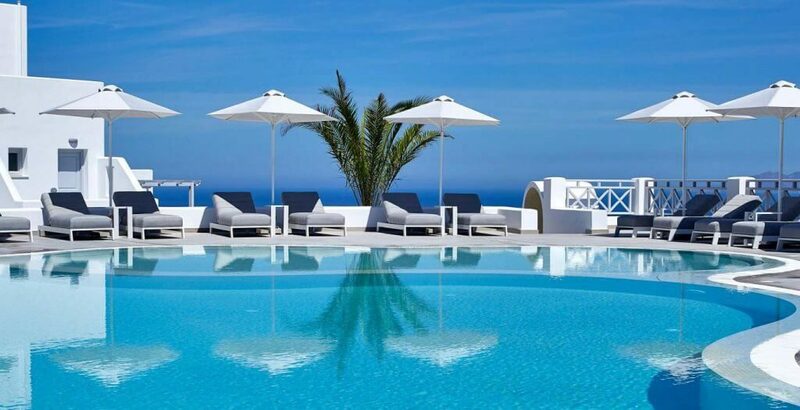 One of the most luxurious hotels in Santorini, this is the perfect place to relax and have a good time if you are in the mood for deep relaxation. The hotel has 45 suites which are decorated beautifully along with suites, villas and also an in-house Mediterranean restaurant. The key feature of this hotel is the spa which offers an array of massages and spa to rejuvenate and pamper yourself. There are also options for private pools if you like a combination of privacy with luxury. Play in the lap of luxury with the Mill House Elegant Suites. 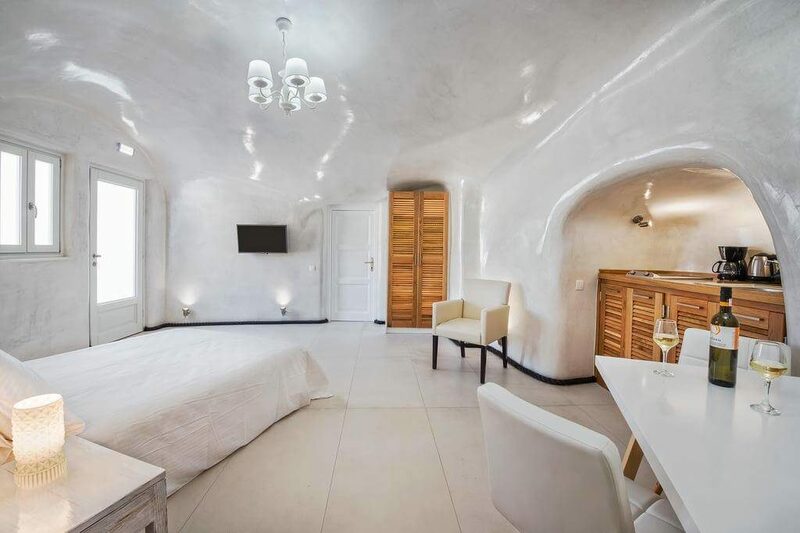 The hotel offers one of the most exotic stays in Santorini. The hotel also offers helicopter services, sunset views on the yacht, private cruises and freshwater Jacuzzis to name just a few of the luxuries it provides. It also offers snorkeling and underwater diving if you are in the mood for some adventure while your stay. Overlooking the cyanic Aegean Sea, the hotel pampers its clients with luxury, breathtaking views and extraordinary cuisine. The hotel also has an infinity pool and one of the most famous and key features include the infinity pool. 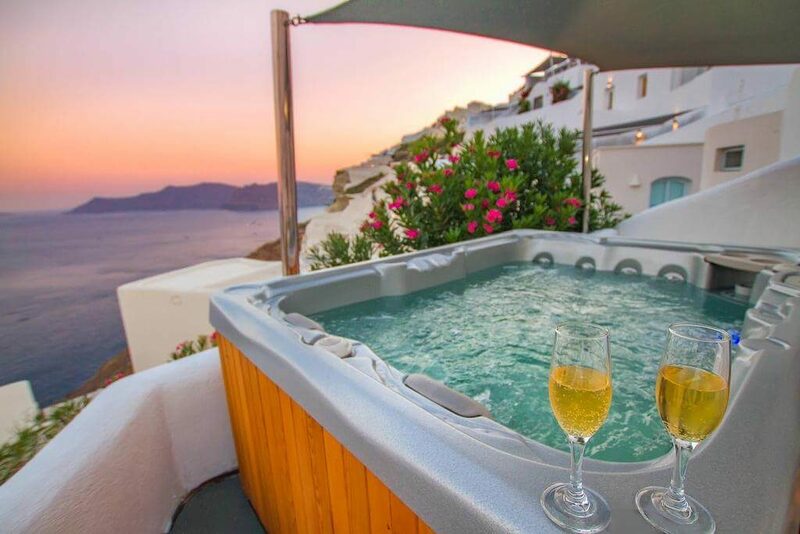 You can also take up suites that offer private hot tubs on the balcony to enjoy a relaxing and peaceful bath away from all the commotion and noise. 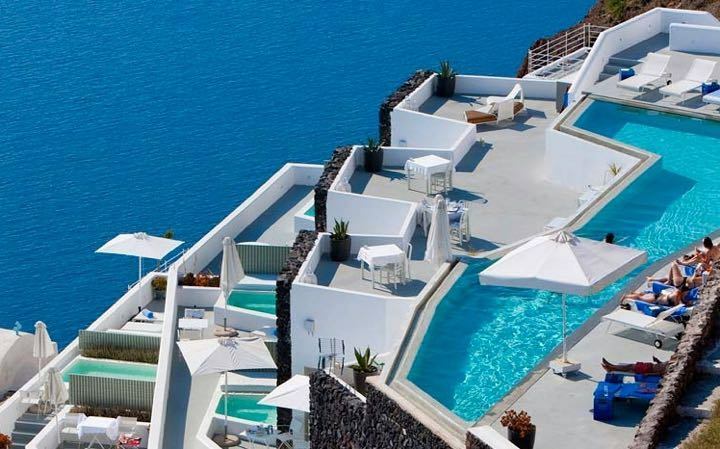 One of the most romantic places to stay in Santorini, as the name suggests the hotel is by the side of a cliff. The hotel has 23 rooms which also provide private balconies with stupendous views. You can go to the lotus spa for rejuvenation and relaxation. The local bus stop is also very close to this hotel so you can take a ride up to the Perissa Pebble beach, the Red beach and the Perivolos black sand beach. Private balconies with pools and a terrific view! What else could one ask for? The Porto Fira Suites offer one of the most blissful and lavish experience one could possibly think of. Serving authentic Greek breakfast in your private balcony will serve as one hell of an experience. The mouthwatering cuisines of the in-house kitchen and exceptional views of the sunset cruise are one of the most remarkable things one can ever experience in his or her lifetime. Peace and serenity are best experienced at this hotel. The hotel also provides complimentary pick and drop service from the hotel which indeed makes the traveler special. Facing the Aegean Sea, the hotel is a family run hotel with jaw-dropping food which provides maximum luxury and comfort for the traveler. 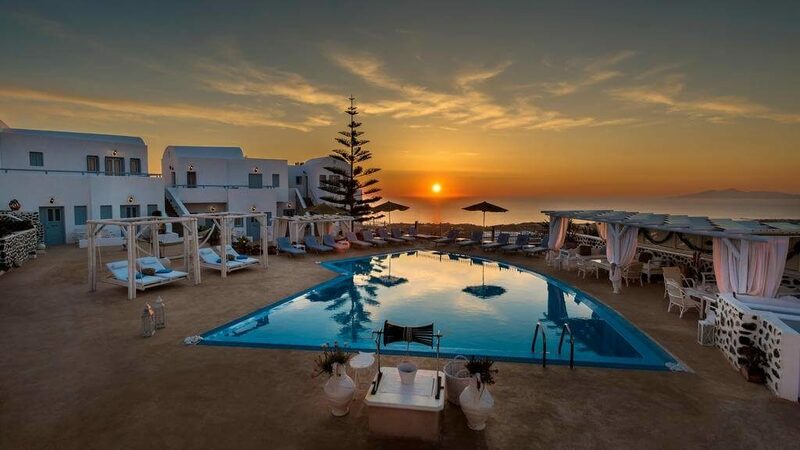 You can relax by the poolside while watching the gorgeous sunset Santorini has to offer which is the perfect escape amidst the hustle of life. The hotel is a Cycladic-style hotel that also offers complimentary ferry rides. What is better than a luxury hotel that fit our pocket? Absolutely nothing and that is hotel Atlantida for you. 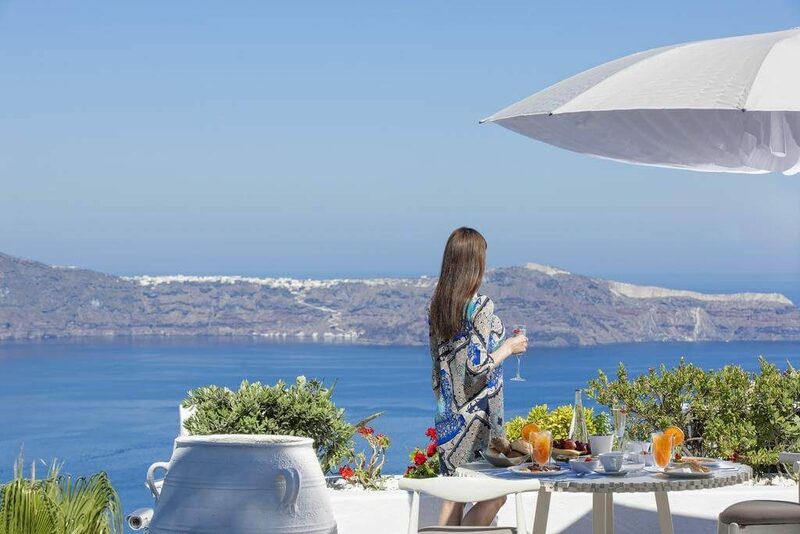 With the center of Oia just a few minutes away this hotel is between the cliffs with a clear view of the Azure Sea. There is also a private sit out area for every customer that makes the experience indeed a remarkable and mesmerizing one. 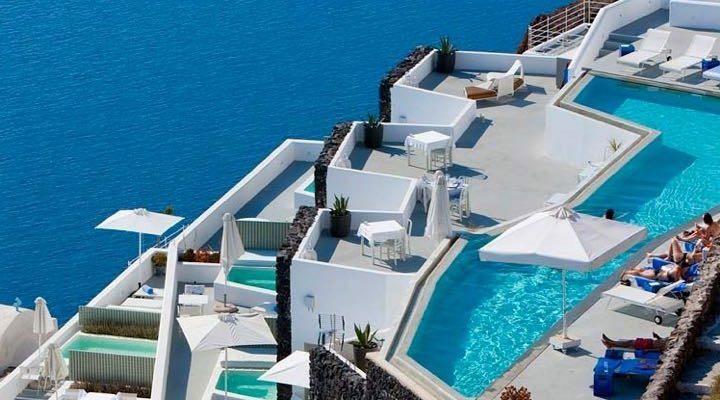 This hotel has one of the best locations in entire Santorini! 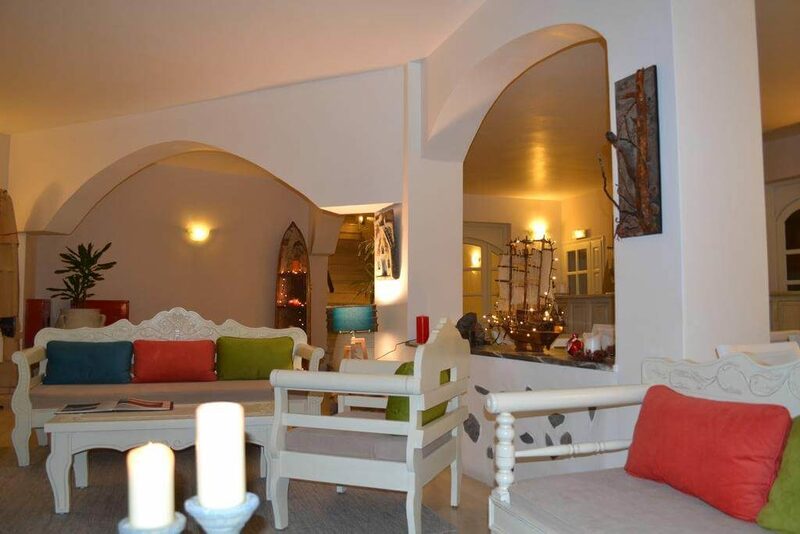 Based in the heart of Fira, the pelican hotel has the most breathtaking interiors you will ever experience. The garden restaurant serves authentic Greek food and wine which will pamper you amidst the beauty of nature. 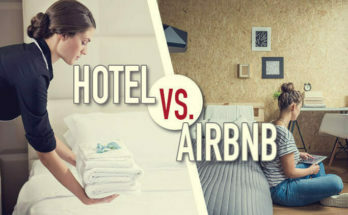 The best part about this hotel is that it won’t be heavy on your pocket as it is pretty nominal compared to its competitors. The hotel is also close to cafes, hotels, market, and bus and taxi stands to make the stay very comfortable and easy going for the travelers.